On September 1, 2004, a group of rebel extremists took over a school in Beslan, Russia on the first day of classes, holding a thousand people hostage. For three days, more than a thousand children and adults were imprisoned and terrorized in a sweltering gymnasium, denied food and water, and forced to keep their hands over their heads. The harrowing siege, chronicled in “Children of Beslan”, ended on September 3, 2004 with a series of explosions and a hail of gunfire that killed some 350 people –half of them children. The tragic death toll outstripped the tragic 2002 Moscow theatre siege by Chechen extremists in both the number of victims and horror quotient. In addition to the Beslan dead, more than 700 people were hospitalized, mostly children, many with serious injuries. Six to 12-year-old children recount the events that left indelible memories, and forever robbed them of their family and friends. The fact that only children appear on camera — no adults are interviewed – brings into dramatic focus the senselessness of the school occupation, as well as loss of innocence suffered by the children. There are a lot of things on television that can make you weep while watching them (in a pinch, any ER rerun will do), but it’s rare to come across a program that leaves you sobbing in a ball on the couch for some time after it’s over. 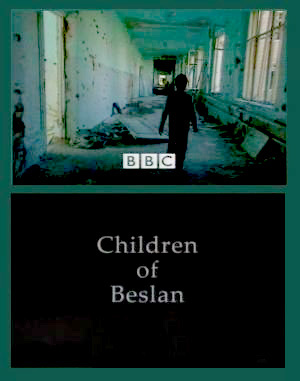 That may seem like a strange sort of recommendation, but for all its bone-crushing sadness, I don’t know that I’ve ever seen a made-for-TV documentary I’d recommend as highly as Children of Beslan, which premieres tonight at 8 p.m. ET on HBO. Co-directed by the British documentarians Ewa Ewart and Leslie Woodhead, the hourlong film revisits the terrorist siege that began one year ago today at an elementary school in the town of Beslan, about a thousand miles south of Moscow. For three days, Chechen extremists held nearly 1,300 people hostage in the school’s gym, refusing them food and water and terrorizing them with homemade bombs strung from the ceiling on wires. On the third day, as the bombs began to go off, Russian forces stormed the school. In the end, the siege and its aftermath resulted in the deaths of 331 people, more than half of them children. Given the extreme nature of the events it recounts, Children of Beslan is most remarkable for its unsentimental spareness. It consists entirely of interviews with children who survived those harrowing three days in the school gym: no adult talking heads, no voiceover narration (though occasionally an intertitle appears to clarify the chronology of the siege.) We don’t even hear the offscreen voices of whoever’s interviewing the children. There are some short clips of news footage of the event, and a few gruesome scraps of video shot by the terrorists themselves inside the gym. But the bulk of the film is nothing but close-ups of individual kids, recounting their memories with a thoughtfulness and gravity that makes you wish that more major news events were relayed to us by people under 10. If you’re still keeping it together after those anecdotes, you might—might—be able to make it through Children of Beslan without losing it completely. But if you can, I’m not sure you’re someone I’d want to know. This entry was posted on Friday, May 7th, 2010 at 7:59 am. It is filed under Films and tagged with BBC, Beslan, Children of Beslan, HBO, Hostage, Russia, Terrorism, Tragedy. You can follow any responses to this entry through the RSS 2.0 feed.